This is the best smartphone Vivo has ever made. Having the best cameras both front and rear, performance is amazing because its equipped with 4 GB RAM. It’s really thin and light weight to hold. I love the battery backup and the design. The 24 MP front camera is the highlight factor of the smartphone and vivo has really done well in this segment. The pictures which were captured comes with good details and less noise. Also, the colour production was good but with every selfie, you will get the fair faces. Even it performs well in low lighting conditions. When I started using this phone I had a mentality of the phone being Chinese productions so it “might not work as good as a phone should” but boy, did it prove me wrong! Battery back up is not appreciable! I have been using this phone for about a month. I feel it&apos;s a good phone in this price range! 1. Battery life is not good. Sporting a full vision 18:9 display, Vivo has come to make mark in the market. It’s made for selfie users and clicks perfect selfie shots. Even the rear camera has a lot of potential during day-light. It lacks fast charging and a powerful battery backup but still amazing performance at that price segment. 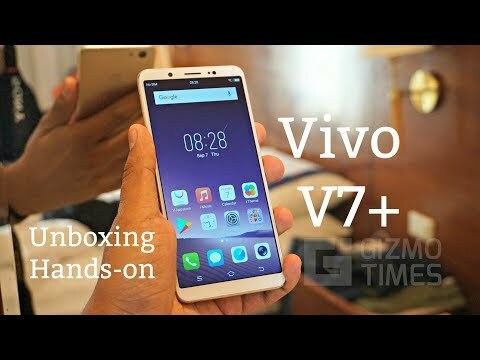 75 Pricebaba users have written their experience with Vivo V7 Plus. If you own Vivo V7 Plus, please do leave your feedback too. Lowest price of Vivo V7 Plus price in India starts at Rs. 13,999 Vivo V7 Plus is available on Flipkart at Rs. 13,999 and on Amazon at Rs. 14,985. Prices updated on 26th April 2019. Vivo, the Chinese brand launched a new variant in its V-series, dubbed as Vivo V7+ in September 2017. The device is expected to be the company's flagship device of the year. The smartphone features a plastic body weighing in at 160 grams and measuring just 7.7 mm at its thickest point making the smartphone not only slim but also relatively lightweight. On the rear side of the smartphone is where its main camera is situated, below which is its fingerprint sensor which is located in a squarish cut-out. On the front, Vivo has integrated its almost edge-to-edge, Full View display which spans out at 5.99 inches diagonally covering most of the front side of the phone. The HD display of the Vivo V7+ has a resolution of 720 x 1440 pixels thereby sporting a pixel density of about 269 PPI. The smartphone has been marketed to have one of the best selfie cameras that can be found on a smartphone boasting a front-facing snapper having a 24-megapixel sensor with an aperture of f/2.0. This camera is further enhanced with bundled software tweaks that make the device capable of capturing really aesthetic images. On the rear side, the Vivo V7+ features a 16-megapixel primary camera having an aperture of f/2.0 coupled with PDAF autofocus and LED flash. Under the hood, the offering from Vivo sports an octa-core Snapdragon 450 processor from Qualcomm clocking at 1.8 GHz. The smartphone also features an Adreno 506 GPU coupled with 4 GB RAM to keep the phone lag-free in most circumstances. The phone ships with 64 GB of internal memory which can be expanded up to 256GB through microSD card support. To keep the smartphone up and running, Vivo has incorporated a non-removable 3225 mAh Li-Ion battery pack that should get you a day's worth of battery backup on a single charge. On the connectivity front, the Vivo V7+ is quite capable featuring Bluetooth 4.2, Wi-Fi 802.11 b/g/n/ac, GPS, and a micro USB 2.0 connector for interfacing it with your computer or USB OTG. Ans: Yes the phone has a good possibility of getting future Android updates. Ans: At 24 megapixels, the Vivo V7+ probably has the best selfie camera in any smartphone. Ans: No, the 3225mAh battery of the phone is not user removable.